Multicore PVC Intruder and Security System Wire Ideal for Wiring Door and Roller Shutter Contacts, PIR and Dual Tech Sensors, Bell Boxes, Keypads, Bells, Beam Sensors, Vibration Sensors, Connecting Digital Communicators and Dual Path Devices such as Red Care or Dualcom Units. 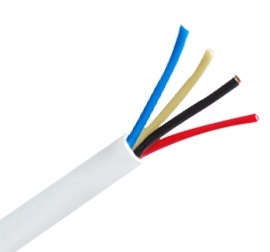 Plain annealed high quality copper conductors both Insulated and Sheathed with PVC. Conforms to BS4737 part 3, BS6360 and BS67464. General purpose Intruder Alarm cable suitable for use mainly in Intruder Alarm systems as well as low voltage and low current applications. This cable offers an ideal way to supply magnetic contacts on doors and windows as well as motion sensors.